The 12th annual event showcases exciting careers in aviation and aerospace to over 700 students in the Mid-Atlantic Region. 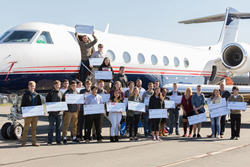 ProJet Aviation hosted the 12th annual Aviation Education & Career Expo, showcasing exciting careers in aviation and aerospace to young adults (ages 16-22). The event featured keynote speakers, live demonstrations, and static displays with representatives from over 60 aviation and aerospace organizations, including the US military, emergency medical airlift, law enforcement, maintenance and avionics repair, government agencies, private aviation, in-flight catering, and more. Key partners and scholarship donors include: Avemco Insurance, Av-Ed Flight School, Averett University, Aviation Institute of Maintenance, Aircraft Owners & Pilot’s Association (AOPA), Air Culinaire Worldwide, Aviation Adventures, Bowling Green State University, Cirrus Aircraft, Delaware Park, Eastern Aviation Fuels, Embry Riddle Aeronautical University, Florida Memorial University, Frederick Flight Center, Geico Insurance, Greater Washington Business Aviation Association, Harris Teeter, Hoxton Agency, JetLinx, Kansas State University Polytechnic Campus, Lewis University, Liberty University, Marywood University, Middle Tennessee State University, Monroe Technology Center, Mosaix Software, Inc., National Agricultural Aviation Association, National Air Transportation Association, National Business Aviation Association, Open Air Flight School, Paragon Aircraft Detailing, Paramount Business Jets, Pittsburgh Institute of Aeronautics, Regent University, SAAB Sensis Corporation, Sharp Details, Inc., Sugarloaf 99’s, The Aviation Foundation, Toth Financial Advisory Corporation, University of Maryland (Eastern Shore), USAIG, Vaughn College of Aeronautics & Technology, World Fuel Services, and Ventus International Aviation. In addition to the student scholarships, Philip Arnold of Frederick County’s CTC Engineering Program at Frederick Community College was recognized as the 2017 Teacher of The Year. “Phil has been mentoring high school students from the CTC program and bringing them to the Expo for five years. He has produced 14 winners equaling over $60,000 in that time. This is a true testament to his hard work and dedication to teaching,” said ProJet’s Julie O’Brien. The Aviation Education & Career Expo hosted by ProJet Aviation at Leesburg Executive Airport (KJYO), in Leesburg, VA is one of the largest and most successful aviation education events in the United States, awarding hundreds of thousands of dollars in scholarships to high school and college students pursuing careers in the aviation and aerospace industry, since its inception in 2005. The event features keynote presentations by industry leaders, static and live aviation demonstrations, and scholarship awards from universities, small businesses, and corporate sponsors. Cofounded by aviation professionals Julie O’Brien and Sarah Thompson, the Expo is committed to helping students explore the many career opportunities available to them through the world of flight. ProJet Aviation is the DC metro region's premier aviation hospitality company, dedicated to helping people accomplish extraordinary things through the wonder of private flight. The company operates ProJet Center, a Fixed Base Operation (FBO), at Leesburg Executive Airport (KJYO), general aviation’s gateway to Washington DC, Dulles, and Virginia's Horse & Wine Country. Established in 2007 as a partnership between former airline pilot and entrepreneur Shye Gilad and noted entrepreneur and philanthropist Sheila C. Johnson, Founder & CEO of Salamander Hotels and Resorts, ProJet Aviation combines the operational integrity of the world’s best airlines with the refined service of a world-class resort. ProJet’s numerous accolades include recognition as a Washington Business Journal’s Best Place to Work, Loudoun County Chamber’s Service Business of the Year, and an Inc. 500/5000 Fastest Growing Company.